Not all exercises are created equal. Some exercises do a far better job at working certain muscles then others. That being said you want to do the exercises that will work your chosen muscle group the best. For example the bench press does workout the shoulders but the military press works out shoulders far more effectively. If your looking to train your shoulders you would want to choose the military press over the bench press then. It is crucial to select the most effective exercises for all your muscles in order to promote maximal growth in each of them. 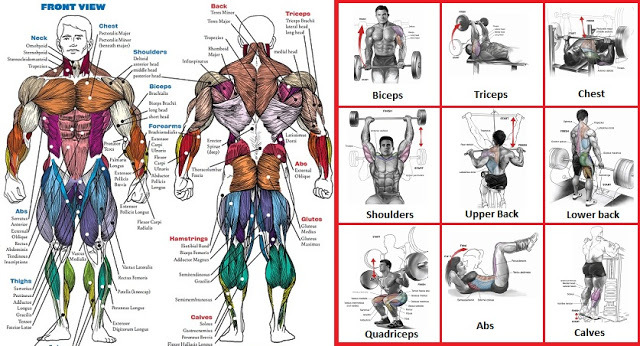 The list below shows the most effective exercises in each muscle group. No matter what kind of routine or training your following you should keep these exercises in your routine. They will promote optimal growth for each given muscle group. As an added effect most of them are also compound exercises, meaning they will train more then one muscle group as well. For example the bench press trains the chest most effectively but it also works triceps, shoulders and lats. Studies have shown compound exercises promote the creation of testosterone in our bodies. Testosterone is what our bodies use to build muscle. The more testosterone is being produced the better. You cannot go wrong with trying a list of exercises that trains each muscle group optimally and stimulates the production of testosterone.